Defying prevailing political winds, Congress has passed, and President Obama just signed into law, the Workforce Innovation and Opportunity Act (WIOA) -- the first update to federal workforce programs in nearly 15 years. This unique moment of bipartisan, bicameral unity is notable not solely for its rarity within the current climate of legislative inertia, but because WIOA will provide critical support to millions of Americans struggling to gain the job skills they need in this tough economy. Beyond its enormous impact on America’s workforce, we believe Congressional action in passing WIOA is also a landmark achievement in making public policy more innovative and performance-driven. Of particular note is WIOA’s bold endorsement of “Pay for Success,” a public-private partnership-based approach to financing social service programs that could greatly improve outcomes across government, while saving taxpayers millions of dollars over time. It is not often that you can simultaneously increase results and decrease public spending, but Pay for Success is one of the most promising solutions we currently have for doing so. Members of Congress and the President are to be applauded for embracing this more accountable approach. At the most basic level, Pay for Success is a performance-based contracting arrangement between government and a social service provider in which impact is measured rigorously and government only pays “for success” when results are achieved within a specific timeframe. By only paying for programs that are working, these funding models use taxpayer dollars more efficiently and direct resources to programs getting real results. Instead of measuring only nebulous outputs, such as the number of people serve by a particular program, in Pay for Success the focus shifts to a more meaningful measures of outcomes achieved (such as jobs secured) by the services provided. Because Pay for Success arrangements do not require pre-determined interventions, local and state governments can be flexible in selecting innovative and effective programs to deliver much needed services in their community and may lean toward strategies that prevent bad outcomes instead of waiting until remediation is necessary. In some cases, private sector funders may provide up-front financing for the delivery of services (an arrangement often known as “Social Impact Bonds”), taking on the risk that the intervention will not succeed and receiving success payments only if it does. Programs like this are underway at various stages of maturity in New York, Massachusetts, California, Utah, Ohio, Illinois, Connecticut, Michigan, and other states, on issues ranging from incarceration recidivism to mental health and early childhood education. The Massachusetts Juvenile Justice Pay for Success Initiative, which my colleagues had a role in shaping and funding alongside Goldman Sachs and other partners, is the country’s largest. The $21.8M, multi-year deal aims to expand the work of Boston-based nonprofit Roca Inc. with a goal of cutting by 40% the number of at-risk young men who cycle indefinitely in and out of the justice system in Massachusetts. Roca’s model is based on intensive outreach and counseling, job training, and job placement, and if expanded successfully, it could reverberate well beyond the low-income communities it transforms in Massachusetts. This social impact potential is the driving force behind participation from private sector entities like Third Sector Capital Partners, Social Finance, the Bloomberg Foundation, Goldman Sachs, Bank of America, Merrill Lynch, J.B. Pritzker, and many others. The WIOA legislation will ramp up the use of Pay for Success across the country even further by allowing local workforce boards to use up to 10% (close to $300 million total) of the federal funding they receive overall for workforce development for performance-based partnerships at the local level. This ground-breaking provision in the bill was a result of significant collective advocacy effort on behalf of the America Forward Coalition, a nonpartisan policy initiative of the venture philanthropy and social innovation firm, New Profit Inc. Members of the America Forward Coalition worked closely with key law makers in both the House and the Senate on shaping this component of the bill. The Corporation for National and Community Service is wrapping up an $11.2M competition at the Social Innovation Fund for Pay for Success initiatives. Yesterday, Senators Orrin Hatch (R-UT) and Michael Bennet (D-CO introduced the Pay for Performance Act, a bill that is similar to the Social Impact Bond Act that was introduced in the House in June. That bill was driven by Congressmen Todd Young (R-IN) and John Delaney (D-MD), along with their colleagues Representatives Jim Griffin (R-AR), John Larson (D-CT), Tom Reed (R-NY), Jared Polis (D-CO), Dennis Ross (R-FL), Joe Kennedy (D-MA), and Aaron Schock (R-IL). The legislation would create a $300M Incentive Fund that would be used to expand Pay for Success approaches across the country. The U.S. Departments of Education, Health and Human Services, and Labor are currently working on a request for proposals to select up to 10 performance partnership pilots to address better outcomes for disconnected (or “opportunity”) youth. Congress provided new authority to utilize an estimated $130 million of existing discretionary funding with additional flexibility to achieve better outcomes through such pilots. In FY14, Congress approved Second Chance Act dollars to be used on Pay for Success approaches to help those returning from prison and reintegrating back into their communities. In mid-June, the Senate Appropriations Committee approved a draft of the 2015 fiscal year Transportation, Housing and Urban Development, and Related Agencies Appropriations Bill. The bill recommends a Pay for Success program to encourage environmentally friendly utility use. Earlier this month, Congressman Dennis Ross (R-FL), member of the House Committee on Financial Services, along with Representatives Sean Duffy (R-WI), Jim Himes (D-CT), Emanuel Cleaver, II (D-MO), and John Delaney (D-MD), introduced the Pay for Success Affordable Housing Energy Modernization Act, bipartisan legislation that will provide the Department of Housing and Urban Development the authority to establish a demonstration program and enter into budget-neutral, performance based agreements that result in the reduction in energy or water costs for multi-family housing. 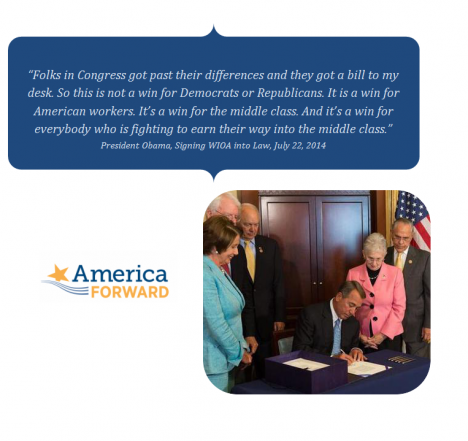 The WIOA legislation and other recent advances show that Pay for Success is gaining momentum. Congress and the President have overcome the forces of political inertia, and we hope leaders at the state and local level and in the private sector add to the momentum. The potential impact over time could be measured in millions of lives improved and millions of taxpayer dollars saved. Smolover is the executive director of America Forward, a public education initiative of the venture philanthropy organization New Profit Inc., and leads the America Forward Coalition of over 50 innovative organizations achieving results in education, workforce development, and poverty alleviation.